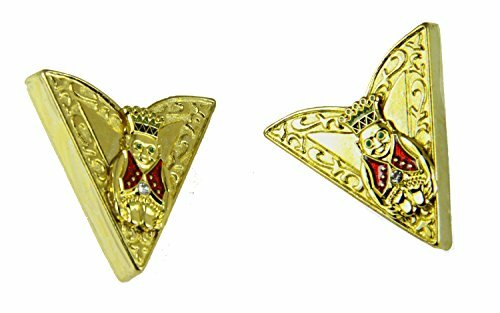 This is a brand new in package set of 2 pieces polished gold tone collar tips with a Jester Billiken emblem permanently attached. The tips measure approx 1.25 inches on each side. Very well made, sturdy and durable. They each have a thumb screw on the back to secure them to your collar tip. We also have Mason, Scottish Rite, Shrine as well as many Shrine units, please inquire. They will come in a small gift box. Makes an excellent gift for your formal Shrine event. Zysta 40pcs Stainless Steel Collar Stays Bones Support Dress Shirts 2.5" 2.75"
Shang Zun 30 Pcs Orange Plastic Collar Stays in Clear Box, 2.2"